Did you just install the October 2018 Update? If so, there’s more than 10 GB of data wasting space on your hard drive—we had 21.8 GB! On a laptop or tablet with a limited amount of storage, this can fill up your device quite a bit. If you have a computer with a large amount of available storage, you might not even notice this useless data. It’ll stick around for 10 days until Windows automatically cleans it up. But, if you’re pressed for space, you’ll want to clean it up as soon as possible. Upgrading between “builds” of Windows 10–like from Windows 10’s April 2018 Update to Windows 10’s October 2018 Update–is treated the same as upgrading to an entirely new Windows operating system. When you upgrade to a new “build,” Windows creates a Windows.old folder that contains the system files from your “old” Windows installation. This allows you to “go back” to the previous build of Windows 10 if you experience a problem with the new build. However, this folder can use more than 10 GB of space on your hard drive. 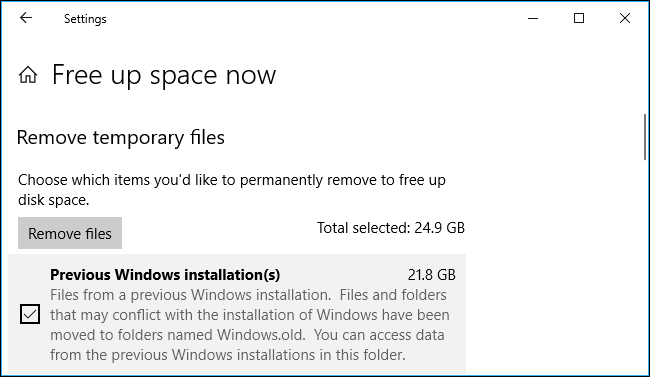 Windows will automatically remove it after 10 days, but you can remove it sooner to free up the space immediately. Warning: You should only do this if your PC seems to be working properly. If you have some issue with the new version of Windows 10 on your hardware, you won’t be able to “go back” to the previous build without completely reinstalling Windows after you wipe these files. 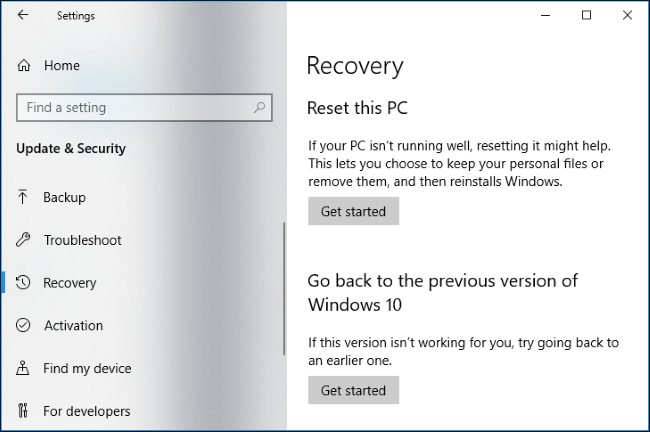 You can go back to the last build of Windows 10 you had installed by navigating to Settings > Update & Security > Recovery and using the “Get Started” button under “Go back to the previous version of Windows 10.” This button is only present if the files are still available on your computer. If everything seems to be working fine after a few days, you can go ahead and remove these files. You don’t need to delete the Windows.old folder by hand, and you shouldn’t. In fact, some of the system files you need to remove are located outside of the Windows.old folder, anyway. 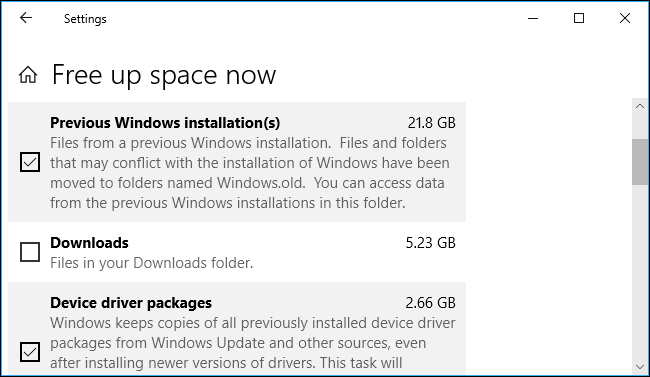 Starting with Windows 10’s April 2018 Update, you can now erase these files using the new “Free Up Space” tool in Settings. To access it, head to Settings > System > Storage > Free Up Space Now. Check the “Previous Windows Installation(s)” option in the list. You’ll see the amount of space you’ll save next to it here. If you don’t see this option in the list, either you’ve already deleted these files, or Windows 10 has already deleted them for you. Confirm the other types of data you want to delete and then click the “Remove Files” button at the top of the window. Bear in mind that checking “Downloads” will remove all teh files in your Downloads folder, which you may not want to do. Otherwise, it’s safe to delete all the types of data here if your PC is working properly, but bear in mind that checking the “Recycle Bin” option will erase all the files you have in your Recycle Bin. 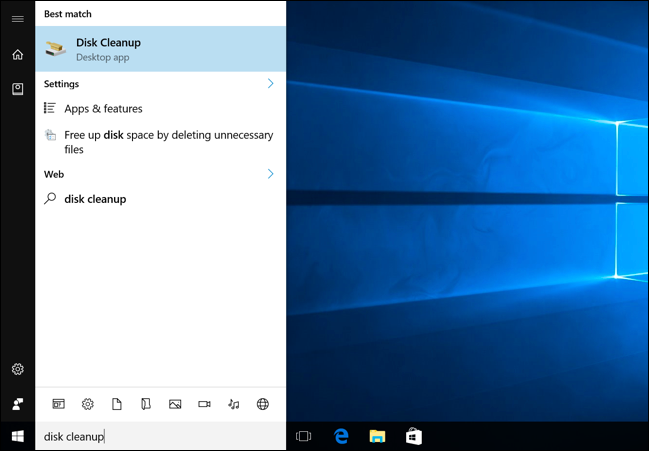 You can also use the Disk Cleanup tool to clean things up for you. 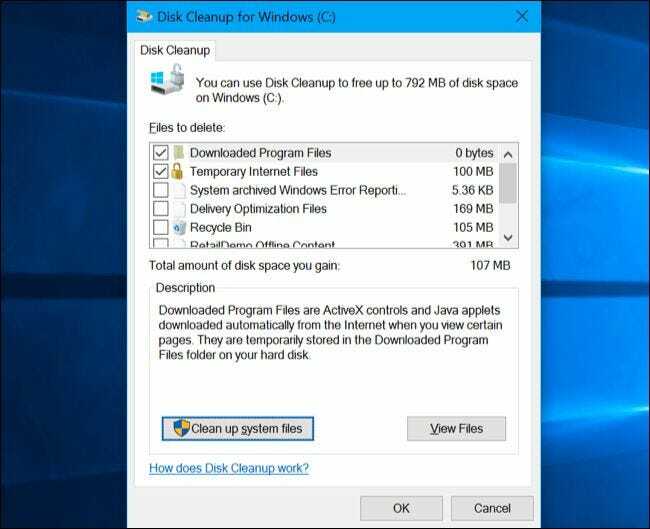 Disk Cleanup is now deprecated, but is still available in Windows 10. To launch it, open the Start menu, search for “Disk Cleanup,” and press Enter. In the Disk Cleanup window, click the “Clean Up System Files” button. Check the “Previous Windows installation(s)” option in the list. You can also check other types of files you want to remove from your hard drive to free up space here. Click “OK” once you’ve selected what you want to remove. 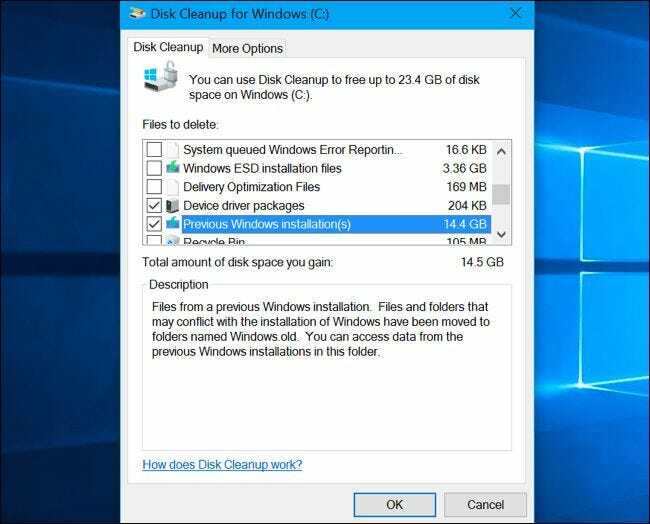 Disk Cleanup will remove the previous Windows installation files and free up the space on your hard drive. If you do need to go back to a previous build of Windows 10 after removing these files, you’ll have to reinstall Windows 10 from installation media with an older build.